The university's 10th advisory was sent out Wednesday night informing students about the resumption of classes on UM's multiple campuses. Decisions on the resumption of classes and changes to the academic calendar were part of the announcement that many members of the UM community had been awaiting. The decisions, that are not completely finalized, were met with mixed reactions. According to Provost Jeffrey Duerk, the changes announced to the academic calendar “are not set in stone yet” and “tweaks” can still be made. Among them, the potential to add a class day on Dec. 16, a Saturday. Duerk said administrators are still trying to decide whether the addition is necessary. However, he said, if it is, it would require faculty senate approval. University of Miami administrators including President Julio Frenk, spent the majority of Wednesday afternoon working through a variety of different adjustments to the fall 2017 academic calendar. Duerk said, around 5 p.m., an agreement was made to cancel the majority of classes until Monday, Sept. 25. Duerk said the conclusion was based on multiple factors such as student housing availability and classroom conditions. However, he said the most important was safety. 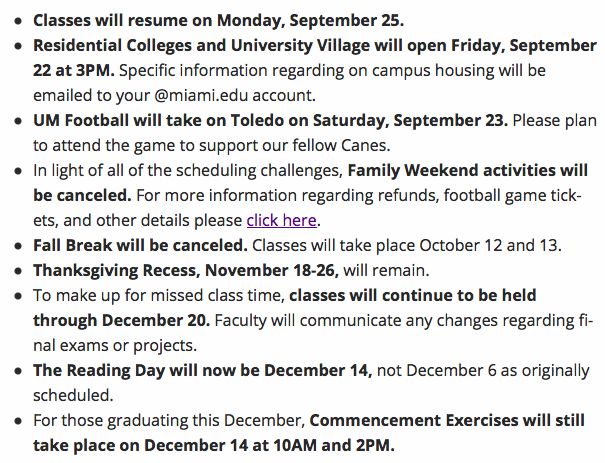 It has been almost 10 days since UM sent out an Emergency Notification Network (ENN) Alert to students, faculty and staff announcing the cancelation of “classes and all student related activities” for the remainder of the week of Sept. 4. Hurricane Irma, a brewing storm at the time, was expected to hit South Florida that weekend. The university sent an alert with a slew of dates on class resumption around 7 p.m. Wednesday, Sept. 13. Shortly after, a letter from Vice President for Student Affairs (VPSA) Patricia Whitely was released with changes made to the academic calendar. Many students, including senior Virgilio Capote, were hoping to return to school as early as next week. However, to Capote’s surprise, not only were classes canceled for another week but so was fall break, originally scheduled for Oct. 12-15. Capote said, as a Florida resident, the cancelation of fall break has “added pressure.” He said natives would likely have to spend the majority of this week and the following recovering from the storm. “Where the university may see this week and next as time off for us, that may be made up with our originally allocated time off, the picture is much more dim than the university may be anticipating,” said Capote, a double major in communication studies and philosophy. Change to the semester had been anticipated. Whitely said the fall academic calendar was undergoing revision in an interview with The Miami Hurricane on Sept. 10. 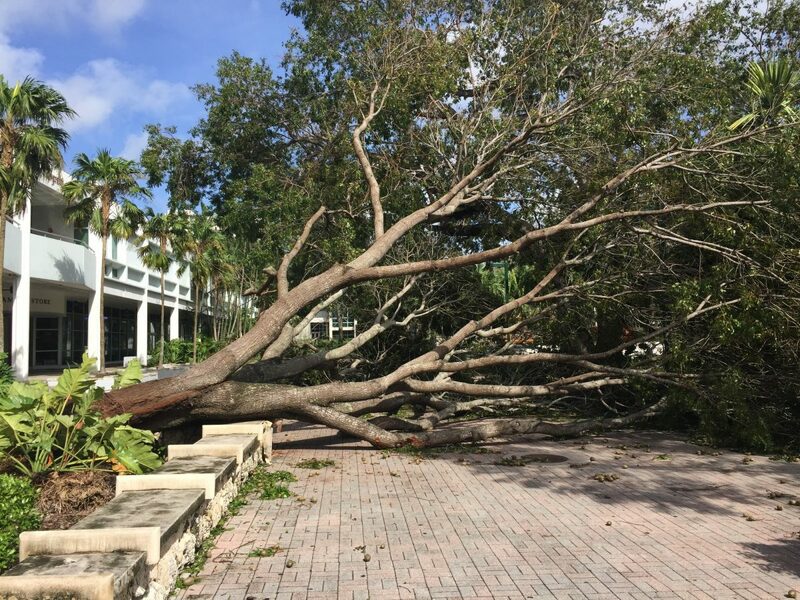 The last time major changes were made to the school’s calendar was after Hurricane Wilma in 2005. The storm forced campus to close for a week. Eight days of reading and exam days were transformed into regular class days to make up for the missed time. Classes ended on Dec. 14, originally the semester’s last exam day. Whitely’s letter Wednesday announced the extension of classes until Dec. 20. The university has opted out of holding a traditional final exam period by having finals happen during class times, at the discretion of faculty. The letter also said a Reading Day, scheduled for Dec. 6, had been moved to Dec. 14. Commencement will still be held on Dec. 14. For senior Earl Generato, commencement occurring before the end of classes is not “ideal” but said he understands the university accommodations. He said his main concern is making the most out of his last semester at UM, including taking classes outside of his major. For some students, the administrative decision to extend classes a week in December has brought a financial hurdle. Traditionally, the university’s full year academic calendar is released far in advance. The school’s calendar for the 2019-2020 year is already available on the Office of the University Registrar’s website. Senior Grace Gordon utilizes the advanced notice proactively. She books flights home to Indiana months in advance. Gordon said she had already bought her flight tickets for both fall and winter break. She called the revisions to extend the semester “unrealistic” because students who already have flights booked are expected to “drop everything and shell out money” to change them. Gordon, a double major in advertising and French, said between flights and hotels used to evacuate before Hurricane Irma to having to cancel her upcoming flights, she has spent about $1,000. Duerk said he hopes everyone understands the rarity of a circumstance like Hurricane Irma. “The most important thing for people to recognize is that this is a very unusual and exceptional event and, creativity and flexibility is what we’re asking of not only students but faculty and staff,” he said. More information, including when residential students will be expected to move out after finals is expected to be released in the next few days.